The Penn Spinfisher VI is the sixth generation of this classic spinning reel from Penn. The Penn Spinfisher VI ranges in size from 2500 all the way up to 10,500, giving you a great selection of sizes depending on what you’re targeting. The 2500 size is actually the newest addition to the Penn Spinfisher family. Up until now, the 3500 has been the smallest size available, but due to high demand for a smaller option, you’ve now got the 2500 which is awesome for inshore species such as speckled trout. Along with all of your standards sizes, the Penn Spinfisher VI is also available in a number of sub-series too. They’ve got long cast reels and live liners to choose from in varying sizes as well. All sizes and models feature a metal body and sideplate. To improve the durability of the Penn Spinfisher VI, they’ve introduced new CNC gear technology made of aluminum and brass, depending on what size you’re looking at – more on this later. Another improvement that’s been made on the Penn Spinfisher reel is the IPX5 sealed system. This English protection rating determines how well the reel is sealed. Technically this standard of sealing means that you can spray your reel down after a long day of fishing without risking sand and salt getting worked into the reel. 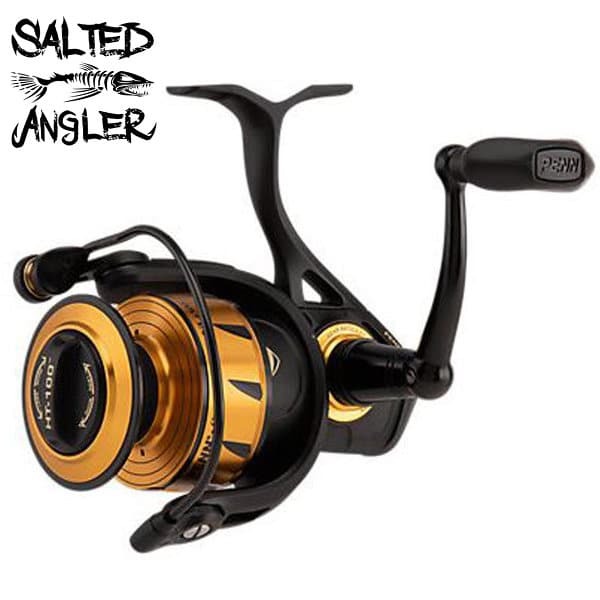 In the real world it also means that if you happen to get slammed by a wave when fishing from the beach or your kayak, you don’t have to be worried about ruining your reel by getting salt and sand worked into the gears. The newest version of a Penn Classic that just got better for saltwater. Very smooth drag in sizes 2500 – 10,500. Watertight IPX5 seal system for saltwater applications. CNC gearing for all models, 6500 and up use brass. 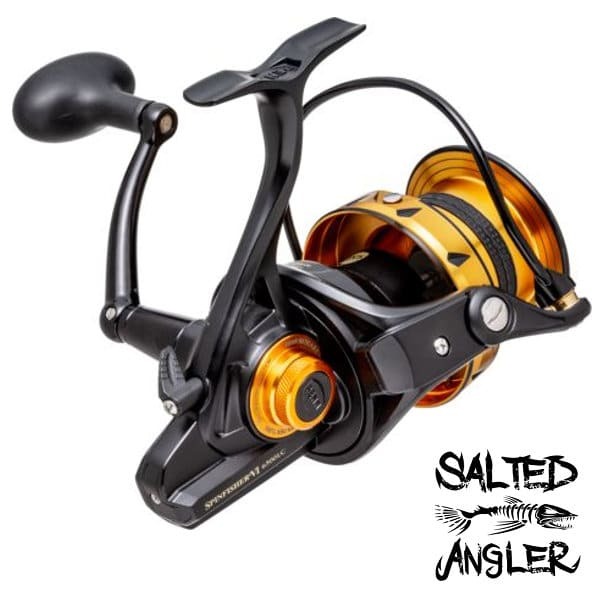 The Penn Spinfisher VI reel is a slightly better version of a standby reel and is available HERE. IPX5 Sealed body and spool design: like we mentioned briefly above, this is an improvement to the seal of the Penn Spinfisher reel body. It means that you can spray your reel down with a hose at the end of the day or let it get sprayed with salt water and the IPX5 seal will prevent any salt, sand or debris from getting into the gears causing your reel to rust and seize up over time. CNC Gear™ technology: the machined main gear that’s featured in the Penn Spinfisher VI is a significant improvement for this line of reels. Not only is the gear system more precise in its manufacturing but it is also lubricated better. When you choose your reel size, you also determine what your gears are made from. While both brass and aluminum are excellent materials that create a smooth gear system that will hold up even under immense pressure, Penn has opted to use brass gears on the 6500 and above models for the added strength and durability. HT-100™ drag washers made of carbon fiber: the completely sealed spool protects the carbon fiber drag washers on the Penn Spinfisher VI. This gives you the stopping power you need to catch large saltwater fish without any resistance whatsoever. The HT-100 material is proven in previous models to stand up to the test of time and create a smooth drag. 5+1 stainless steel sealed ball bearing system: the 5+1 stainless seal ball bearing system is kept snugly within the body of the Penn Spinfisher VI reel, away from the elements. It is tightly sealed within the metal exterior to make sure that no water or salt or even sand penetrates and damages it. Despite this, you have easy access into the ball bearing system for occasional maintenance, and the smooth turning cogs allow you to adjust for line and casting without any issues whatsoever. Full Metal Body: having a full metal body on a reel means that you do not get any flex in the reel even under heavy loads such as cranking in a big striper or bull red. Often when catching larger fish, the gears are at risk of being put under too much pressure. When the body of the reel is made out of metal, though, the gears are guaranteed to stay aligned and protected from any type of wear and tear. Superline Spool: the Penn Spinfisher VI super line spool means that you can cast up to 100 miles before you wear this reel out. While it’s hard to comprehend this type of endurance, it means you’re almost guaranteed a high functioning reel for a long time without any malfunction or wear and tear. There aren’t that many alternative reels out there that offer this kind of durability. What’s also great about the super line spool is that the rubber ring keeps your line from slipping, eliminating the need to use Mono as a starter if you are spooling up with braid. Line Capacity Rings: the Penn Spinfisher VI line capacity rings allow you to instantly see at a glance how much line is remaining on your spool when fighting a larger fish. The spool is marked in 1/3, 2/3 and full line capacity rings. 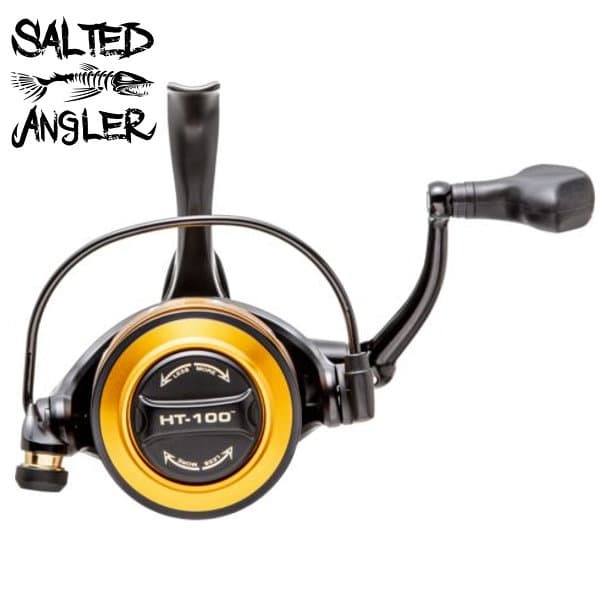 Sizes 2500-5500 have automatic bail trip: with the automatic bail trip available in sizes 2500-5500, you don’t have to worry about wearing out your hands to close the bail of the spinning reel. Instead, you can use the sturdy handle to crank them closed, streamlining the entire process. 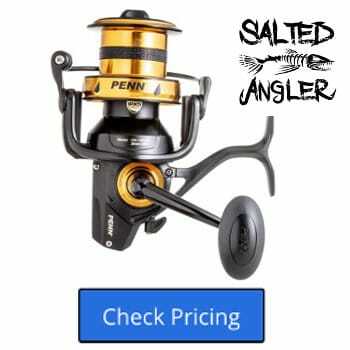 Sizes 6500-10500 have manual bail trip: if you’re someone who is used to closing your spinning reels bail by hand, the Penn Spinfisher VI is just what you are looking for in sizes 6500 to 10,500. While you can always close the bail by hand on the smaller series of reels, I still recommend closing it by hand as it will lengthen the life of your reel. As you can see in the chart below the new Penn Spinfisher VI spinning reel comes in 11 different models ranging from the newest 2500 which is excellent for your smaller inshore species all the way up to a 10,500 which is perfect for stripers and other large hard fighting fish such as Grouper, King Mackerel, Sailfish and Tuna. The 4500 and the 6500 also are available in a bail-less model for those of you who like to fish that way. Because Penn has made a bail-less reel in this size, you can enjoy a different type of experience when you fish. While you may not be used to fishing with a bail-less reel, this is an excellent opportunity to give it a go – because you may end up loving it and not wanting to go back. We find that using a bail-less design is best for fishing from a pier or the surf, particularly with plugs. The Penn Spinfisher VI makes it incredibly easy to take the line out of the roller and hook it onto the end of your finger as you turn it. Using a bail-less roller may create a learning curve with getting the reel back in, but it definitely makes casting out easier. This sixth generation of the Penn Spinfisher can take a lot of abuse when out there on the water. This is why it’s considered excellent value for the money – it holds out for an impressive amount of catches while remaining consistent throughout. The resilience of the Penn Spinfisher VI means that you can fish in hard, choppy locations without having to worry if it will hold up or not. It proved to be easy to fish within terrain like this, which means it’s a great option to take with you wherever you head out to an area where you are likely to get a lot of spray or saltwater splashing on the reel. We kayak fish a lot so this is an excellent choice of reels for kayak fishing. The reel is also great at pushing back against offshore winds if you’re land fishing. When you’re in the surf and nasty conditions like offshore winds, rocks and choppy waves, not having a bail is ideal. It creates a carefree experience that could otherwise become frustrating. You can feel the smoothness of the CNC gearing when you crank the reel, as well as its capacity to endure high levels of drag. This is one of the most considerable advantages of having a machine main gear, which is a significant point of difference to note in the Penn Spinfisher VI. When using the live line feature, we found that the drag was easy to adjust. We have been comparing the Penn Spinfisher VI to its predecessor, the Penn Spinfisher V. One of the most significant differences between the Penn Spinfisher VI and the Penn Spinfisher V is the addition of the 2500 size. The Penn Spinfisher V reels have eleven different sizes available, just like the Penn Spinfisher VI, with the exception of the 2500. Again, due to demand and guys wanting to fish from kayaks, Penn has added the smaller size 2500 for your inshore fishing. Another difference that you’ll find between these two Penn reel generations is the seal capacity. With the introduction of the IPX5 sealed system to the Penn Spinfisher VI, you don’t have to worry about getting any amount of sand, salt or dirt in the gear system. With older generations like the Penn Spinfisher V, this was a legitimate concern. In addition to this sealing issue, Penn has also increased the number of HT-100 carbon fiber drag washers featured on the Penn Spinfisher VI. Read the full Penn Spinfisher V spinning reel review HERE. Next from Penn would be the Penn Slammer III which is a slightly more expensive reel because of the IPX6 sealing system. On the Penn Slammer III, you get a slightly more refined version of their IPX sealing system. As they’ve developed their products through the generations, this feature has become more precise and capable of keeping the elements out. Size is also a point of difference between the Penn Slammer III and the Penn Spinfisher VI ranges. Again, you can only go as low as 3500 with the Penn Slammer III. 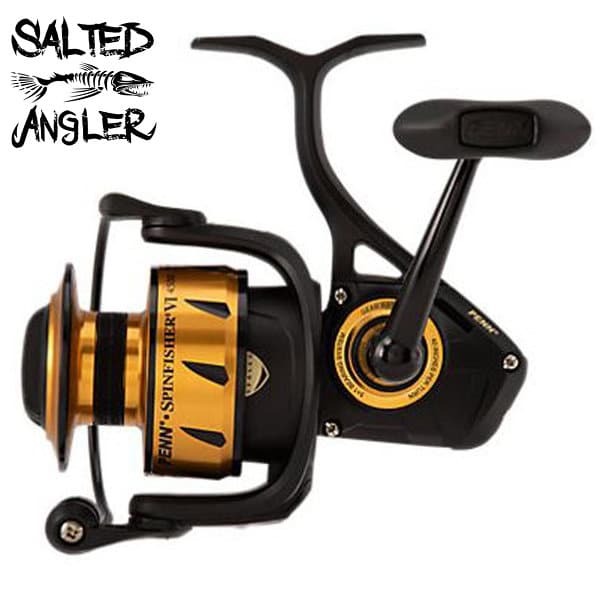 From a weight perspective, the Penn Slammer III is a slightly heavier reel. Read the full Penn Slammer III review HERE. Stepping away from Penn brand for a moment, I will direct you to the Shimano Spheros SW.
With the Shimano Spheros SW, you’ve got an even broader range of sizes available. The smallest size that Shimano offers is a 5000 as compared to the Spinfishers 2500. However, the Shimano Spheros SW does go all the way up to a 20,000 size, which is an excellent option if you’re out there on the ocean or the beach doing some seriously heavy-duty fishing. While Shimano Spheros SW range offers similar features, including their drag system, sealed system, and gear alignment, what perhaps stands out for us is their aluminum spool. Aluminum is a great material to use for reels, especially the spools because it’s much stronger than using die-cast aluminum or even graphite. While Penn Spinfisher VI features a full metal body which includes the spool, Shimano has utilized aluminum on their spool to their advantage. Not only does it provide you with a lightweight handling experience, but it doesn’t compromise on strength in the process. Read the full Shimano Spheros SW spinning reel review HERE. The Penn Spinfisher VI range is Penn’s new and improved generation of top rated fishing reels. What we loved particularly about this new range is that you still get all of the much-loved features for a similarly affordable price. Penn isn’t charging you that much more to enjoy their improved reels. What’s more, they also come with a couple of brand new features, which include the IPX5 sealed system and the CBC gear technology. Sometimes it can be hard to justify trading in your trusty Penn reel that hails from an older generation. Companies like this bring out new editions all the time, but it doesn’t mean that you have to rush out for it. However, with the new and improved Penn Spinfisher VI range, you do have an excuse to exchange your older model in. 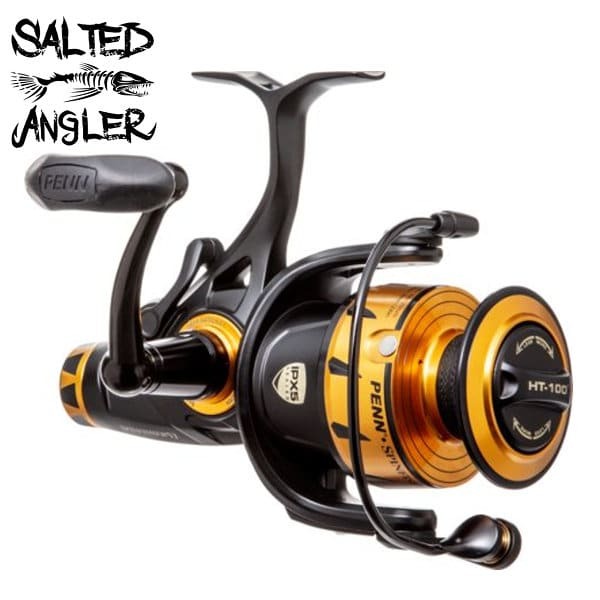 Overall, we think that this new, modern range of reels from Penn are affordable, versatile, and come with features that help them to stand out in the game. 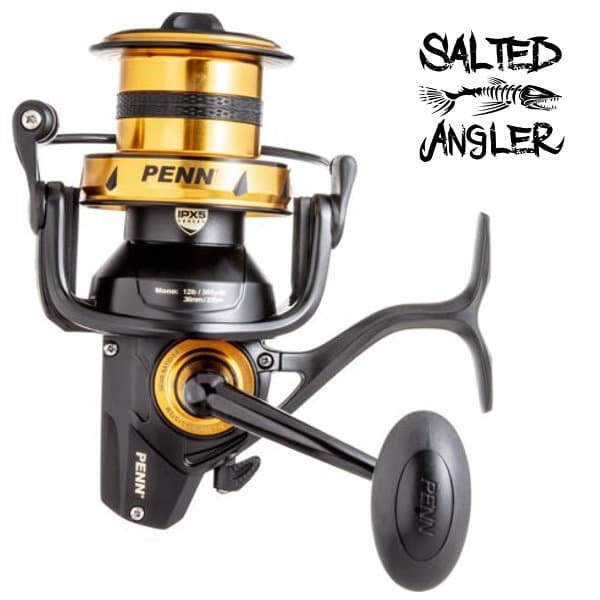 If you’re already a fan of Penn reels and are looking to upgrade your existing model for one that’s new and improved, we suggest giving their Penn Spinfishing VI range a try. With the range of available sizes and choice of aluminum or brass for the gear technology, Penn has created a range that caters for every type of fisherman. Whether it’s rough land fishing with offshore wind or casting off a kayak, Penn’s new range of reels has got you covered.